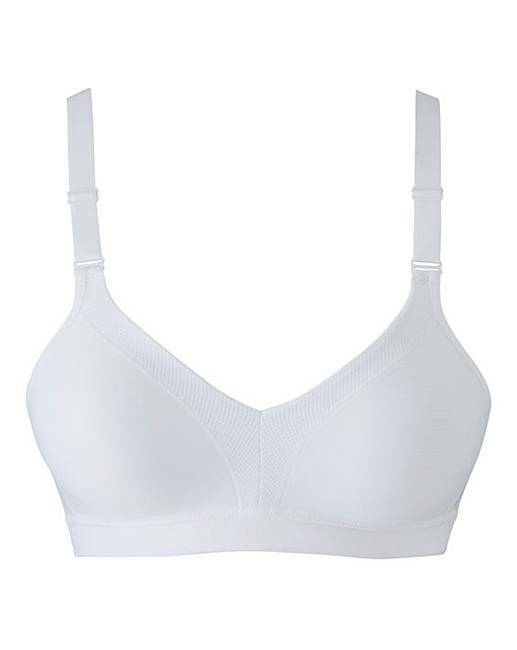 Triumph Triaction White Sports Bra is rated 4.7 out of 5 by 3. Unwind, take a deep breath and feel your body - not your underwear. This non-wired sports bra from the Studio Wellness series by Triumph is so light you won't feel it, offering support and comfort.Bi-active stretch fabric, this garment contains LYCRA SPORT fibre, engineered to provide exceptional recovery power, fit and freedom of movement. The perfect companion for workout and leisure days. Soft, wire free cups offering natural contouring. Light mesh lining. Sport tank top fit with wider sides and back. Adjustable straps. Super soft hook and eye fastening. Unwind, take a deep breath and feel your body - not your underwear. This non-wired sports bra from the Studio Wellness series by Triumph is so light you won't feel it, offering support and comfort. With bi-active stretch fabric, this garment contains LYCRA® SPORT fibre, engineered to provide exceptional recovery power, fit and freedom of movement. The perfect companion for workout and leisure days. Soft, wire-free cups offering natural contouring. Light mesh lining. Sport tank top fit with wider sides and back. Adjustable straps. Super-soft hook-and-eye fastening. Rated 4 out of 5 by Jackie52 from Lovely looking bra Very comfortable, looks good on. Soft fabric and support not bad. Rated 5 out of 5 by mary52 from Grandaughter loves this bra. Bought this bra for my grandaughter this is the second one I purchased she loves it that much, and gives her the support she needs and its so comfortable she tells me. Rated 5 out of 5 by Named pencil case from Fantastic Looks amazing on as well - been after a white sports bra for my daughter for school and this is perfect. She said is dead comfy and does the job it’s meant to.